Brittany Bowlen has been cast as the favorite among the Bowlen children to be approved by the trust. She's about to take a significant step toward that goal. 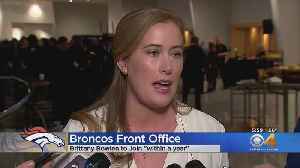 A Bowlen family member will join the Broncos management team relatively soon.